Dr. Walter C. McCrone (1916 – 2002) is often referred to as the “Father of Modern Microscopy” because his work revolutionized the use and understanding of the light microscope for materials analysis. Dr. McCrone was a charter member and director of McCrone Research Institute in Chicago from 1960 until 2002. Dr. McCrone trained thousands of students worldwide in the use of microscopy, wrote hundreds of articles and books, gave thousands of presentations and lectures on microscopy, and developed numerous accessories, techniques, and methodologies to push the state-of-the-art in microscopy. Walter C. McCrone, Jr. was born in Wilmington, Delaware on June 9, 1916. He grew up mainly in New York State and attended Cornell University where he completed his undergraduate degree in Chemistry in 1938 and was graduated with a Ph.D. in Organic Chemistry in 1942. 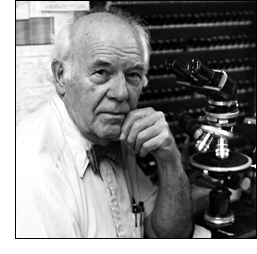 In the 1990s, Dr. McCrone and his wife Lucy endowed a Chair of Chemical Microscopy in the College of Arts and Sciences at Cornell. Named the Émile M. Chamot Professorship in Chemistry, it honors Émile Monnin Chamot, a Cornell professor of Chemical Microscopy. McCrone Research Institute has an active association with Cornell University to this day. After two post-doc years at Cornell University, McCrone accepted a position as a chemist (microscopist and materials scientist) at Armour Research Foundation (now, IITRI) from 1944 thru 1956 where he rose to become Assistant Chairman of the Chemistry and Chemical Engineering Department. In 1956, McCrone left the structured world of the University to become an independent consultant and, on April 1, 1956 he founded McCrone Associates, Inc., Chicago (now located in Westmont, IL). In 1960, McCrone Research Institute was incorporated in Chicago, Illinois. Dr. McCrone founded McCrone Research Institute as a not-for-profit organization devoted to the teaching and research of light and electron microscopy. As director of the Chicago Institute, he expanded its activities to include McCrone Research Associates, the sister organization in London, England. Since its beginning, McCrone Research Institute has taught more than 28,000 students in all facets of microscopy. The Institute remains a leading educational facility within the world of microscopy. Dr. McCrone was also the editor and publisher of The Microscope, an international journal started by Arthur Barron in 1937 and dedicated to the advancement of all forms of microscopy for the biologist, mineralogist, metallographer, forensic scientist, and chemist. The Microscope publishes original, previously unpublished, works from the microscopical community and serves as the proceedings of the Inter/Micro microscopy symposium held in Chicago each year. It emphasizes new advances in microscope design, new accessories, new techniques, and unique applications to the study of particles, fibers, films, or surfaces of any material whether inorganic, organic or biological. During his 60-year career as a chemical microscopist, McCrone published more than 600 technical papers and 16 books and chapters. The Particle Atlas, his best known publication, written with other McCrone Associates staff members, appeared as a single volume in 1970 and as a six-volume second edition in 1973. It was available on CD-ROM and is still recognized as one of the best handbooks for solving materials analysis problems today. Dr. McCrone was, at the same time, a humanitarian extraordinaire. He served on the Board of Directors of Ada S. McKinley Community Services, Inc., since 1951 and as Board President from 1964 to 1995. The Agency, a not-for-profit human services organization, has 40 program locations, a staff of 560, an annual budget of $40 million, and serves more than 15,000 clients annually throughout Chicago. In recognition of his many years of dedicated service to the Agency, in 1997 they dedicated their new facility in honor of Dr. McCrone, the Walter C. McCrone Industries facility. The facility houses 120 clients in its sheltered workshop program and provides intake, evaluation, and job placement for more than 1,000 program participants annually. He also served on the boards of VanderCook College of Music in Chicago and The Campbell Center for Historic Preservation Studies in Mt. Carroll, Illinois. Throughout his remarkable and outstanding career as a pioneer in microscopy and microscopical techniques, McCrone received many other honors and awards. A few of these honors follow: in 1970, the Benedetti-Pichler award in microchemistry from the American Microchemical Society; in 1977 the Ernst Abbe Award of the New York Microscopical Society; in 1981 the Anachem Award of the Association of Analytical Chemists; in 1982, the Certificate of Merit from the Forensic Science Foundation; in 1984, the Distinguished Service Award (Paul Kirk Award) of the Criminalistics Section of the American Academy of Forensic Sciences; in 1988, the Madden Distinguished Service Award, VanderCook College of Music; in 1990, the Irving Selikoff Award of the National Asbestos Council; in 1990, the Founder’s Day Award and in 1991, the Roger Green Award of the California Association of Criminalists; in 1991, the Fortissimo Award, VanderCook College of Music; in 1993, the Public Affairs Award of the Chicago Section, American Chemical Society; in 1999, the Émile Chamot Award from the State Microscopical Society of Illinois, and just in June of 2002, he received the August Köhler Award from the State Microscopical Society of Illinois and is the only person to have received both of the Society’s awards. McCrone Research Institute is committed to Dr. McCrone’s vision for the future and celebrates the dream that he lived and practiced every day: to increase the use of the light microscope through education, research and dissemination of knowledge.